More Trash Mob Minis can be found here. Buried decades ago, the great treasure of the notorious Captain Jadescale is waiting at the Mistcliff. Though the exact location of the treasure is unknown, it’s said that the owner of the Shore of Dreams has clues about the location, although nothing is ever that straightforward when it comes to treasure. Can you unearth the secrets of the treasure of Captain Jadescale or will you be undone by its mystery? A Dungeons & Dragons adventure for characters of level 5 to 7. "It's very atmospheric, and a breath of fresh air amongst a lot of clones." "This module was a nice change of pace from the usual fare." "The story kept my group guessing right up until the end." "Worth every penny. Probably worth five times every penny. Buy it. Read it. Run it." - Travis L.
"Highly recommended!" - Richard M.
"You see all these reviews, speaking of greatness and golden standards? They are all true. No need to add anything more." - Jason B. "[...] I highly recommend this module to anyone who enjoys one-shots [...]" - Adam D.
"[...] Definitely worth the $3 for any DM to have in their back pocket." - Curt S.
"[...] I love this adventure [...]" - Adam C.
"[...] I cant wait to run it again. [...]" - Steven W.
"[...] a fantastic excercise in roleplaying and [...] combat." - Jay B. "[...] It was really fun, nice story line for oneshot, with great characters. 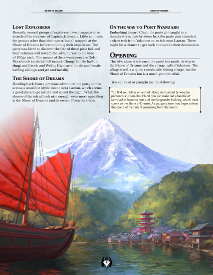 [...]" - Kate S.
"[...] My players fully enjoyed the villain as well as the asian theme. [...]" - Justin H.
"[...] This was a single session adventure for my group, and everyone loved it." 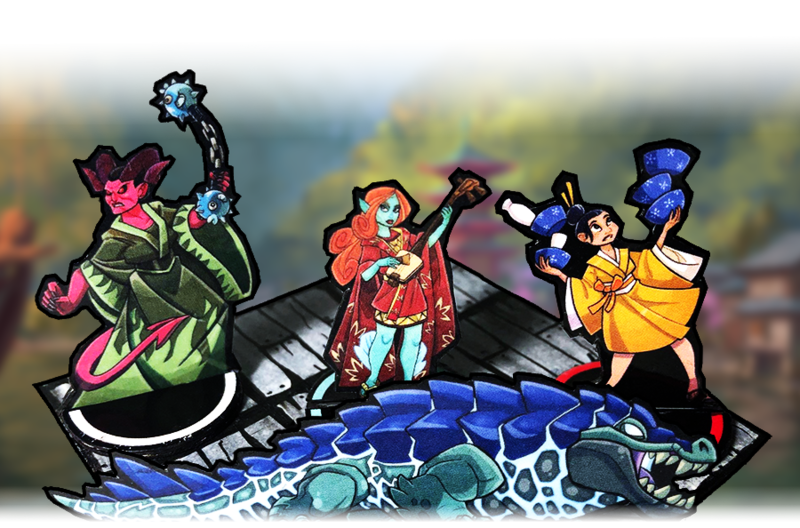 - Bryan H.
"[...] The NPCs are well rounded and lively, the plot is intriguing and engaging and the setting is adorable and unique. Probably the best adventure module I ever bought." - Alyssa B.
Hi, read through the adventure. Looks awsome! Great work! Any tipps to scale it up for three lvl 11 players? first of all thank you for purchasing Shore of Dreams. You are wonderful. I must admit, this is a tough one, as you have a party roughly five level over what I think is the sweet spot, but also you have one body less. With that, I think you should always be wary and make quick changes on the fly. 1] I think you can safely approach the adventure with APL 8 or 9 in mind, so you migitate for one player less. 2] Action economy will be a crucial factor, with that in mind I don't suggest any changes to room T4. 3] Just change the main cast & the Tempest Beast. The Tempest Beast and a certain martial arts expert are straightforward to convert using the DMG. 4] When upgrading the main villain, choose thematic spells that give her an edge in deceipt and let her try to prey on a weak party, though again, don't go over board, you want to challenge them, not outright kill them off. 5] As I suggested below in Lisa's question, if you want to add a...See more body, let your three have one of the prisoners help out. They might be very healthy and want to even the scores a bit ;). 6] As also suggested below and already alluded here, a victory feels always sweeter than a cheap death, so I'd rather you be cautious in the scaling instead of trying to match everything. 7] You have APL 11 players, which mean you probably got this, you cam all this way here! Identify key events, challenge them there, so you make for memorable moments. Also look at the spells that could hamper the adventure, since it was not conceived with those spells in mind, find natural ways why they might not work this time, or creative solutions by changing the structure of the adventure. Here you can show your expertise and knowledge to make this your own adventure amd what you learned DMing on the way! 8] Don't be afraid to change things up. What if the villain wants to conjure a being you created (if I suggest within the theme of the what awaits later)? What if this is only the prelude, room T5 was especially created with that in mind ;), so this can be a springboard to something even greater and set them off on a thing you created! Again, sorry for being so broad, but these are major changes in terms of party size and level and I don't want to give hard numbers that won't check out in the end. I hope I could give you some pointers that help you to have fun on the table! Thank you for your respons. Is exactly what i looked for. I love the setting and i'm sure with some changes it will be also a blast for lvl 11 players. I hope there will be a tale of wonderful persons enjoying themselves to tell! thank you for reaching out, while it will be hard to scale things that way back, like everything D&D it is not impossible. We recommend roughly the following remedies. Since this module is done in two parts, you can try things out in the combat encounter at the first part and get a feeling. The second part would be a bit trickier, especially in room T4. So be very merciful. Another cool way to bring the party to the more or less required four persons would be having the prisoners go along with your party and you can quickly whip out an additional character sheet per character. Ranger and Babarian would be the two...See more most obvious classes for the prisoners. Give your party of two control of them, though still try to be a bit more generous since managing two character sheets might be a hard task. Otherwise you can also use a better or boost the suggested statblock for them, so they can match the party. If you don't want your party to control more character sheets or players, always look out for HP and damage to change in order to scale down the statblocks, room T4 will be your only big worry. Get rid of the spawns and scale the damage waaaaay down, as the action economy will trip them up otherwise. Unfortunately, because D&D is more geared to an average party of four, this is the best we can do for now. - nerf or substitute statblocks and enemy numbers. For example one (in)famous tiefling could use the iron shadow statblock from Volo's Guide to Monsters, if you have access to it. Last but not least, don't be afraid to make this too easy. A victory feels always better than a quick TPK. Happy to help, hopefully your players will have a blast, but we have a feeling that with your level of dedication and you going all out on preparation, you will ace this and make for a wonderful experience on the table. I'm excited to run this as a one-shot for some friends in a few weeks. I will be having a very large group, potentially up to 8 players. Would you recommend I scale them down to level 4 players or just up the HP on the monsters? Hey there, glad you are excited, we sure are, too! We'd rather recommend to adjust the combat encounters. Add HP and or monsters, but don't scale the party down, or they might run into problems in room T4. No problem! Have a blast playing! Absolutely love this adventure. My players fully enjoyed the villain as well as the asian theme. Grade A work Florian. Florians interview on the Crit Academy podcast was also fantastic. Can't wait to go thru it again ...as a player. Any interest in having this converted for use in the Fantasy Grounds virtual tabletop program? If so, shoot me an email and we can work out some details (grimlore.entertainment@gmail.com). first of all, thank you for reaching out and your interest in converting Shore of Dreams! However, we would be happy if future offers would be made to our mail address, which you can gleam from our twitter page. Currently we got some offers and are reviewing them for viabilty. Ran this last night. Was a great 1 shot. took a little over 6 hours. Was on part with official WOtC content and the players had a lot of fun with the various islanders. Was a little tricky getting the players to eat any of the food after the thugs attacked but got 3 of them out cold, guards got 2 others outside while they were plotting and our 6th followed pisca so 5/6 with this paranoid lot wasn't bad. I would definitely say this is a little on the easy side for a party of 6 lvl 5s but I just scaled up the encounters a tiny bit and they all had a good fight on their hands. Funny enough they are considering making a guild and founding it on the island and basing it out of Yokotoro. Thank you for your comment! Glad you had fun and could adjust the encounters accordingly! Don't worry, if they had been paranoid at this part. This is en par with all the playtests and reports we got. Hopefully your party can trust an Innkeeper ever again. Apologies, if not ;). Is there a map of the village included? thank you for your comment. No, there is no map from Yokotoro, as the adventure runs perfectly without this map. Even in some instances / variables where a battle map might be of use, any generic town map can easily substitue for Yokotoro, as it is built with that in mind. Since the portion you can access via the preview deals with all the happenings within town, you can check upon yourself and make up your mind. We hope you are satisfied with what you can gleam from the preview. If you have any further questions, feel free to comment below! Is there any chance that this will be available in print in the future? thank you for taking the time to comment here. While we are exploring this option and have discussed this already with parties that managed to offer their products as Print in Demand, we can't announce anything yet. We know, this is probably not the answer you searched for, but this is all we can offer at the moment. Please follow us on Twitter under @poisonpotpress as we will probably announce any decision in this regard there first. 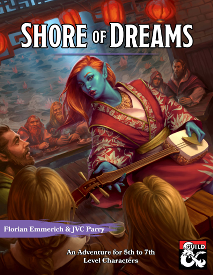 By praising Olhydra and some prophecies coming together, we are now able to offer Shore of Dreams as a print title. I'm currently running this module in my Tomb of Annihilation campaign and have to say it has been amazing so far! 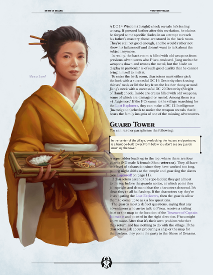 Personally $3 seems like a steal for the amount of amazing artwork and depth in NPC's that you get from this module. If you want to run something that is a bit more of a mystery, but also has plenty of combat, look no further! Thank you for the very nice comment! This is the first product on DM guild that wasn't made by WotC that I not only didnt regret paying for, but want to run multiple times with different groups. So... Whens the next adventure coming out from you all? We are already actively looking for where to go next and are busy brewing up the next adventure. Though believe us, it took us some time to get to Shore of Dreams. So it might take us a bit! However, whach our twittersphere, so you will be among the first to know, when to buckle up for the next ride! 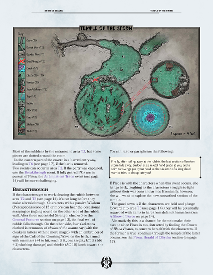 We did a small update and added the maps as non-pdf versions, so you can start using them on your virtual tabletop without any hassle to yourself! Hopefully this helps setting up games more quickly. Sorry that it took a bit! Would it be possible to get some non-pdf versions of the map? you can easily open the pdf for maps into fee products like GIMP, it lets you select the page you want to load in and export it with ease into any other format. That is why we choose to offer the map bundle as pdf files. So it can be handled by anybody, either quickly printed, or converted! If you are still facing problems, you are welcome to reach us at poisonpotionpress(at)gmail(dot)com and we try to sort things out from there. Ooops, that should be free and not fee ;). Oh wow, awesome! Thank you so much!! Played it last weekend as a one shot, took us more than 6 hours but it was a lot of fun and my players had no idea what was really going on. So great work! The six hour mark surely depends on some player reactions and how thorough they investigate each part. Just wondering, how did you make the cover art so that it looks like an official Dungeons and Dragons book? This looks super fun; looking forward to trying it! Thank you. Hope you like it! I’m trying to figure out if this adventure is right for my campaign. What levels is it designed for? The front cover says it's for 5th to 7th level characters. Aha! Reading words. What a novel idea! Those pesky natural 1 ;___;! This title was added to our catalog on January 25, 2018.